The scientists at Maastricht University (the Netherlands) reported in the American Journal of Epidemiology that the women taller than 5 feet 9 inches have increased risks of having breast cancer. A group of American medical specialists from American College of Preventive Medicine, leaded by Dr. John Gaziano, has found that the men taller than 5 ft. 11 inches have greater risks of having prostate cancer. However, this is valid only for the men over age 50. According to a research published in The Journal of the American Medical Association, the men taller than 6 feet and the women 5.5 feet or taller have 81% increased risks of having pancreatic cancer. A recent study at Bristol University helped to find the evidence of the fact that the women with bigger feet have a greater risk of developing breast cancer. Specialists at Harvard Medical School and the Brigham and Women’s Hospital Medical University in Boston have discovered that the men taller than 6 feet 1 inch have up to 35% decreased chances of having a heart attack than small men below 5 feet 7 inches. The researchers at Bristol University are convinced that shorter people have higher risks of developing stomach cancer. Several groups of the experts (from Germany, Korea, etc.) 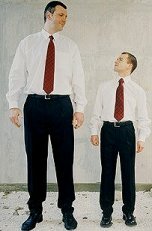 have found the links between shorter body size with smaller head and the risks of having dementia. Finally, according to the British specialists, the people with small legs have up to 19 % increased chances of having Diabetes Type 2. This entry was posted 9 years, 10 months ago.